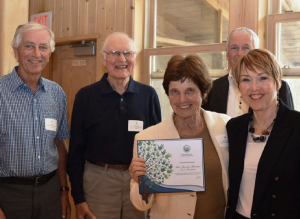 On April 27, the Nottawasaga Valley Conservation Association (NVCA) recognized the Blue Mountain Watershed Trust Foundation with the Conservation Champion Group Award at their Evening of Thanks at the Tiffin Centre in Utopia. This is the first time that the more than 20-year-old Watershed Trust has qualified for this award. Critical to the NVCA’s decision were three joint Trust-NVCA projects in 2016-2017 that evolved through the Watershed Trust’s Silver Creek Stewardship Initiative, funded in large part by the Ontario Trillium Foundation. The three projects included carrying out ecological studies of Silver Creek; hosting two large-scale public environmental events, ‘See the Salmon Run’ in October 2016, and a Seminar on Environmental Issues in February, 2017; and perhaps most significantly, the efforts of Watershed Trust members Blanka Guyatt and Don Avery in leveraging the NVCA Environmental Education program to create environmental awareness among more than 250 students in five regional schools. One other important contribution is the ongoing local campaign coordinated by Watershed Trust member George Powell, Vice-Chairman of the Watershed Action Group (WAG), against the invasive species Phragmites.